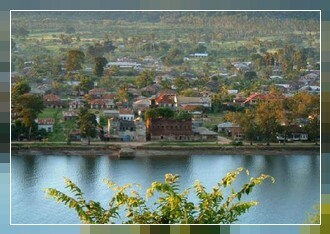 The name Pangani owes to the river that runs through northern part of the Historical Town. Pangani is a very old town, it is believed to be established before 6th Century BC and played an important role during the slave trade era; It was a trading port dealing mainly with slaves and ivory. Several historical sites in and around the town serve as reminders for the strong Arabic influence and the later German, British colonial era in Tanganyika. Nowadays it is mainly a fishing town with a lot of coconut trees, providing nice beaches for quiet vacation. Pangani is situated about 50km south of Tanga on the mouth of River Pangani that flows from the slopes of Mount Kilimanjaro. Attraction: Pangani Falls, a water fall that provides electricity for Tanga, Dar es Salaam, Arusha and Moshi. Pangani River hosts birds and crocodiles. Maziwi Island is a nature reserve which provides ground for snorkeling opportunity and dolphins tour. Walking tour in the town to see some of old buildings that are more than 200 years old, Visits to a former slave labor camps and slave market site. All in All, The beach resort here is fantastic, really cool and calm, our accommodation choices are Agrovia and The Tide.